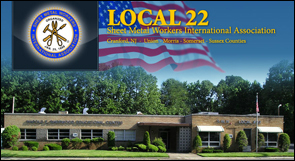 The history of the Sheet Metal Workers’ International Association is that of a strong and dynamic union that has been on the leading edge of developments in organizing, representation and bargaining. January 25, 1888 - Representatives from Peoria, IL; Kansas City; Omaha, NE; Memphis, TN; Dayton, and Youngstown meet in Toledo, OH to form the Tin, Sheet Iron and Cornice Workers' International Association. The President was Archibald Barns, Secretary was A. W. Chatfield, and Robert Kellerstrass was named Treasurer. 1922 - The first air conditioning system for human comfort was used in a motion picture theater. 1925 – Pacific Coast Conference of Sheet Metal Workers agrees to affiliate with the Sheet Metal Workers’ Alliance. Membership grows to about 24,000 with 441 Local Unions. 1942 – During WWII, a number of Sheet Metal Workers were engaged in “secret work” constructing an atomic bomb. 1955 – National Joint Adjustment Board is created by the SMWIA and Sheet Metal and Air Conditioning Contractors National Association (SMACNA) to serve as an arbitration board to resolve grievance disputes after they have been processed through the local level. 1971 – National Training Fund established. 1973 – SMWIA establishes SASMI Program to help underemployed workers affected by the recession. 1981 – National Energy Management Institute created in partnership with the Sheet Metal and Air Conditioning Contractors Association (SMACNA). 1988 – Sheet Metal Workers’ International Association celebrate 100 year anniversary. 2003 – SMWIA joins the Industrial Union Council (IUC). The Industrial Union Council consists of 14 unions with members represented in manufacturing industries across the United States. 2004 – SMWIA Local 41, the first SMWIA local union outside of the United States and Canada is established in San Juan, Puerto Rico. Since its founding, the SMWIA has continued its growth during times of war, peace, depression and prosperity. We now represent 150,000 workers in areas such as shipbuilding, HVAC installation, fabrication, repair, and service; architectural sheet metal; manufacturing, metal roofing and a range of other industries and occupations.